Guests at the “Hotel & Gasthof Schatten” can leave their car safely in the garage. Hiking trails, attractions and shops are just a short distance away and can be easily reached on foot or by public transport. Local buses can be used free of charge with the visitor’s card. Whether you are looking for sports activities, cultural attractions or comfort, there are leisure activities for all tastes, ages and types of weather in the surrounding area. Surroundings Zugspitze can be easily reached via the railroad from the Garmisch-Partenkirchen train station in just over one hour. Alternatively, you can arrive by the Eibsee-cable car from Eibsee in just 10 minutes. Zugspitze is Germany’s highest mountain and the main mountain peak of the Zugspitze massif. It is where the Wetterstein main crest (border between Austria and Germany), the Blassen crest and the Waxenstein crest all come together. Two glaciers are situated in the massif – the Schneeferner and the Höllentalferner. Lieutenant Josef Naus, his assistant Maier and the alpine guide Johann Georg Deutschl were the first people to ascend Zugspitze in 1820 on behalf of the Royal Bavarian Topographical Institute. 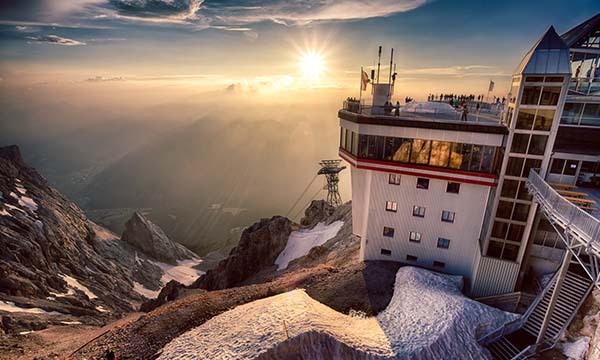 Nowadays, thousands of skiers and snowboarders flock to the Zugspitze plateau during winter time and the mountain peak can be visited virtually throughout the year. And the view is truly something to behold – when the skies are clear, you can see several hundred kilometers over the Alps. 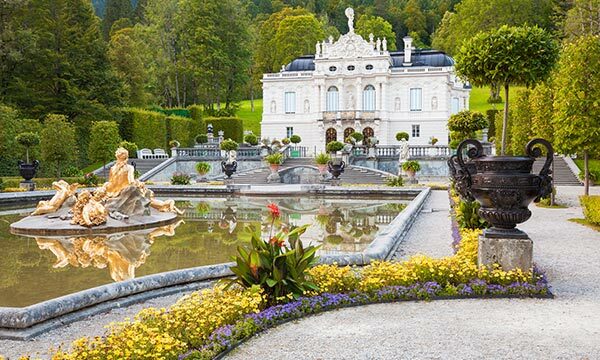 You can reach the smallest and the only completed castle of King Ludwig II by car via Oberau and Ettal or by public transportation (RVO buses) via Oberammergau. The Bavarian king had the palace built in the style of 18th century architecture and it was constructed between 1870 and 1879. It was clearly appealing to King Ludwig II as he spent approximately eight years there. Visitors marvel at the catafalque of the regent in his royal bed-chamber and the sinking table in the dining room which allowed the King to dine without the presence of his servants. The 50 hectare artistic chateau park also accommodates the Venus Grotto, the Moorish Kiosk, the Moroccan House, the so called King”s Cottage, as well as the Huding”s Hut and the artificial grotto with the “Open Sesame” rock. The Ruins of the Werdenfels Castle is located approximately 80 meters above the Loisach Valley – between Garmisch and Farchant. From the ”Sonnenbichl” bus stop it is roughly a thirty minute walk away. The Ruins of the Werdenfels Castle is located approximately 80 meters above the Loisach Valley – between Garmisch and Farchant. From the ”Sonnenbichl” bus stop it is roughly a thirty minute walk away and there is a quaint restaurant nearby. History: The castle was built between the 12th to 13th century and was used as an administrative center of the Werdenfels Countship up until 1632. Following this date, it began to corrode and from 1676, the Vest was used as a stone pit and many of the stones of the castle were used for the construction of the baroque parish churches in Farchant and Garmisch. During 1905-06, the castle walls were secured and partially reconstructed and after the mural crown was secured from 1961-63, further reconstruction measures were commenced in 1986 and these works remain ongoing. From the “Olympia-Skistadion” bus stop (line 1 and 2) it is an approximately 30 minute walk to reach the entrance of the Partnach gorge. Alternatively, you can arrive in the splendor of the horse-drawn carriages. 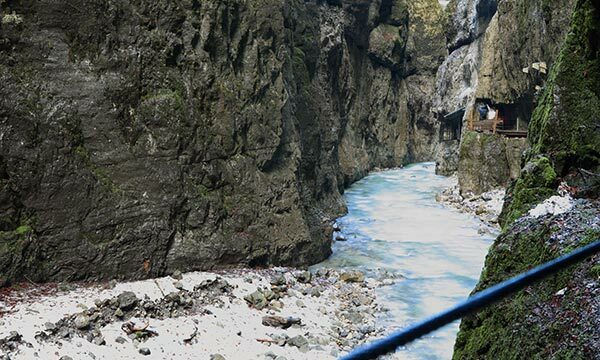 At a length of approximately 800 meters, the Partnach has cut vertically into the rocks and formed a spectacular gorge that extends 80 meters in depth. As early as 1912, the Partnach gorge was declared a natural monument and it has attracted millions of visitors since this date. The slightly ascending path branches away after the gorge and takes you to the mountain village of Vordergraseck. 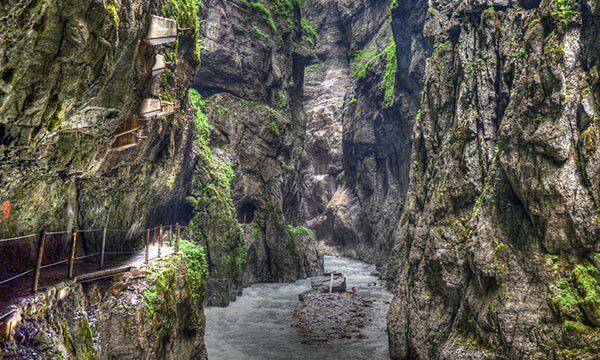 Here it directly leads to further alpine destinations in the Wetterstein mountain range. For those who are brave, you can cross the passes at a height of 68 meters via the iron bridge and reward yourself with a bite to eat at the Partnach-Alm (cottage) or the Grasecker restaurants. 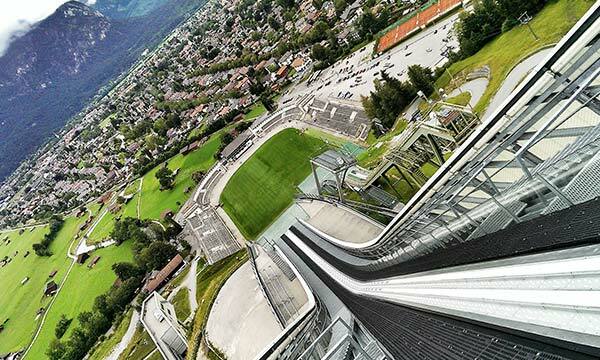 From the center of Partenkirchen you can experience the Olympic Ski Stadium. This can be reached on foot – along the Riedhängen – or by bus (lines 1 and 2). As long ago as 1921, the ski jump was the home of the historic New Years Ski Jump. And during the 1936 Olympic Winter Games, the ski jump competitions were held at the big ski jump. Subsequently, the Ski Stadium was then reconstructed and expanded for the 1940 Olympic Winter Games which were also due to take place in Garmisch. Up until recently, the big ski jump was the oldest one of its kind to be used in the World Cup and was fondly referred to as ”The Grand Dame”. On 14th April 2007, the approach tower and the referee tower were demolished to accommodate the new facilities. And following intensive preparatory work, the new approach tower (a 650 ton steel construction) was erected between 27th November and 28th November 2007 and inaugurated on 21st December of the same year. The first jump was made by Felix Schorft, a young talent from Garmisch-Partenkirchen. He managed to jump a highly impressive 132 meters. From Hammersbach (district of the town Grainau) – where the buses head in the direction of Eibsee – there is an approximately 3 kilometer footpath (300 meters altitude difference) leading you through a narrow valley to the entrance of the gorge. The 700 meter footpath (entrance fee applies) leads through the narrow passes in which the Hammersbach (a creek) becomes a rapid mountain torrent. The hiking trails lead to Höllentalangerhütte (lodge) and later on to Zugspitze, Osterfelderkopf, Alpspitz or further challenging destinations of the Wetterstein mountain range. An attractive path back to Hammersbach will take you along the so called “Stangensteig” which was once used by the miners when the mine situated there was in operation. 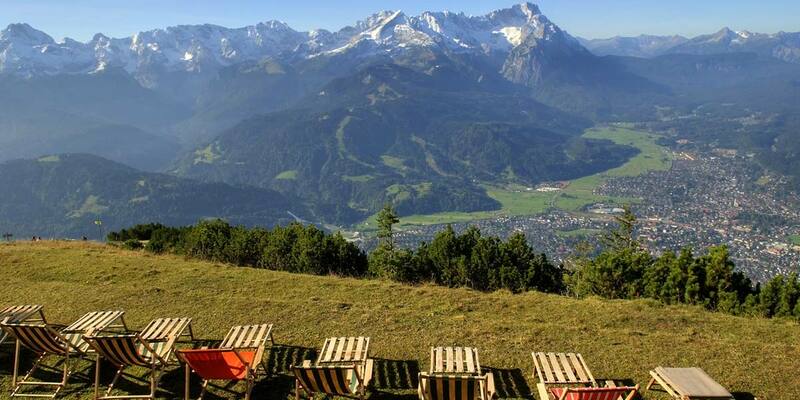 No matter if you are seeking picturesque hiking along alpine pastures or challenging climbing trails, the Wetterstein, Elstergebirge and Ammergebirge mountain ranges offer numerous options for hikers and climbers to pursue their passion. 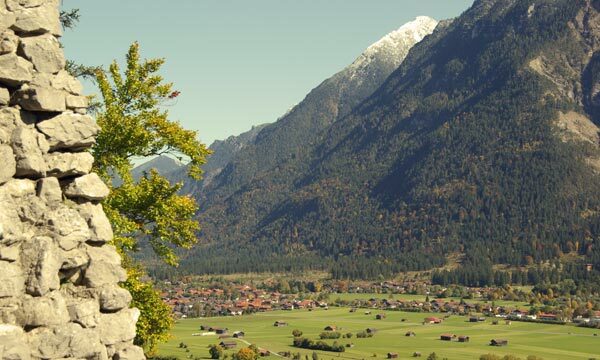 If you do not wish to explore the mountains on your own, you can take part in one the guided tours that are offered by Garmisch-Partenkirchen Tourism and the Werdenfels Alpine Guide Office. These take place three times a week from June until the beginning of October. You can experience forests that look as if they have been wrapped in cotton wool and stunning frozen lakes. 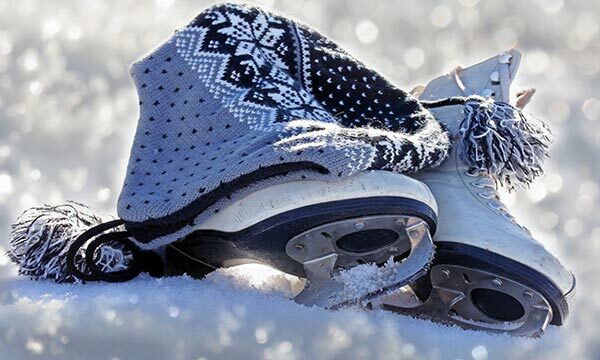 When winter arrives, the snow covered hiking trails are particularly charming and the various quaint cottages and alpine inns are open all year-round to offer you a pleasant atmosphere of warmth and comfort. 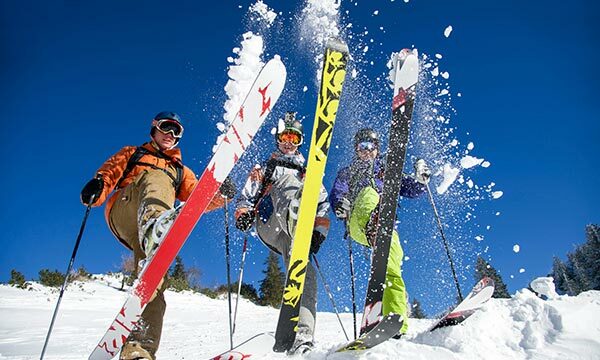 Garmisch-Partenkirchen is one of the most famous places in the Alps for winter sports. The glacier on the Zugspitze attracts alpine skiers, snowboarders, carvers and freestylers on the pistes up until spring. And off-piste skiers will find a true Eldorado of deep powder snow. Meanwhile, the classic ski areas around the Hausberg, Kreuzeck and Osterfelder mountains offer a variety of pistes for all levels of skiing. And the plentiful homey alpine pastures and mountain huts enable you to warm up, have a bite to eat and take in the sun. Nowadays, most of the pistes are equipped with snow making machines. This means skiers reach the bottom of the valley even when there is no snow in the lower regions. It should be noted that those wanting to descend “Kandahar” – Germany”s only piste that is used in the World Cup – should be experienced in alpine skiing. Away from the lakes, the outdoor swimming pools in Garmisch-Partenkirchen and its surroundings – among them the Alpspitz Wellenbad and the Kainzenbad of Partenkirchen with its crystal clear natural water and its sizeable lawn for sunbathing – also invite you to relax and freshen up. Explore the river of Loisach by canoe or kayak. 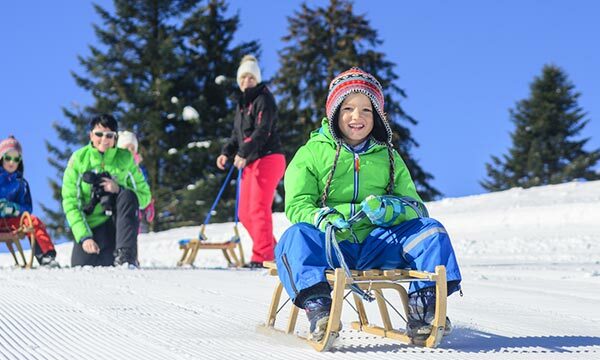 Unbridled fun is guaranteed for the entire family at the 3.9 kilometer toboggan run situated at the Hausberg. The Hausbergbahn cable cars take you up and the force of gravity will propel you down on the toboggan run. A truly unforgettable experience is also the night run on the lit toboggan run (Wednesday and Friday from 6pm to 8pm – please pay attention to the latest notices). An insider”s tip is the 1.6 kilometer run at St. Martin cottage at the Grasberg. After walking uphill, you can stop for a bite to eat at the quaint cottage before racing back down to the valley. 453 kilometers of bike paths – all well marked out – ensure there is the right bike path for you, regardless of whether you prefer professional or recreational cycling. 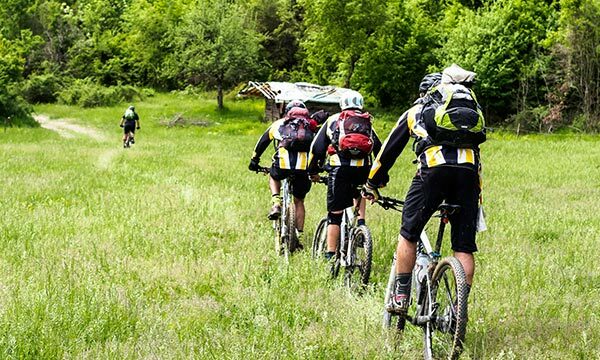 Whether you want challenging mountain bike tours or pleasure trips, Garmisch has the tour for you and its surroundings mean you are in the heart of nature. Your tour will enable you to experience lush alpine meadows, the fragrance of field flowers and herbs, as well as breathtaking views of the alpine panorama. Homely country inns, shady beer gardens and crystal clear lakes invite you to stop along the path and take a little break. 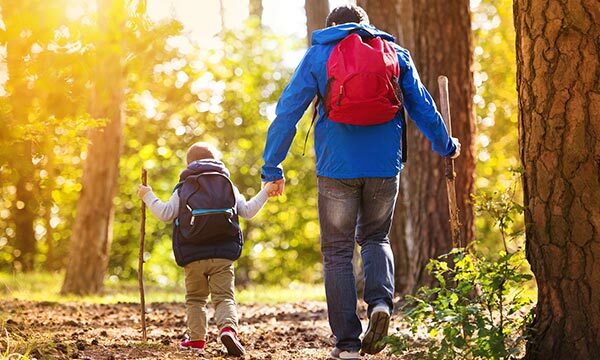 The start and end points of the routes can be easily reached by bus or train, meaning younger children can also enjoy the bike tours without being exhausted by the end of the day. Many of the routes can be combined with hiking tours to allow you to take in scenic lookouts or mountain peaks offering fantastic views. If you like cross country skiing, Garmisch-Partenkirchen and its 29 kilometers of well-prepared ski-tracks is the place for you! There are tracks to suit all – from those who prefer the technique of skating to those who prefer the classical style and there is even a floodlit track at the Kainzenbad. The start of the tracks can easily be reached by foot or by local buses and all tracks are free of charge. 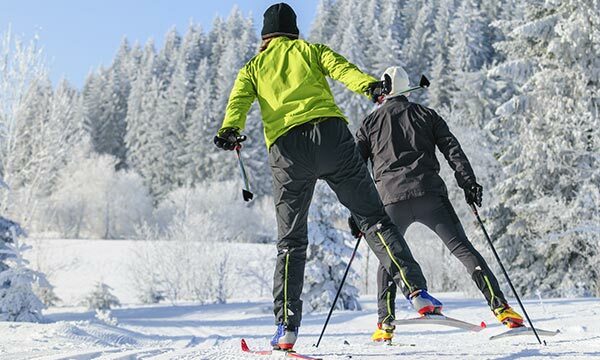 Cross country skiing classes are offered by local cross country skiing schools, from which you can also rent the necessary equipment. Whether it is competition, show, entertainment or just fun, the Olympic Ice Sports Center caters for all, regardless of age. In addition, there are numerous skating opportunities on lakes, so long as the ice cover is adequate. Curling is possible on the lakes of Riessersee and Pflegersee, something that is a fun, longstanding tradition and for the young and old alike.